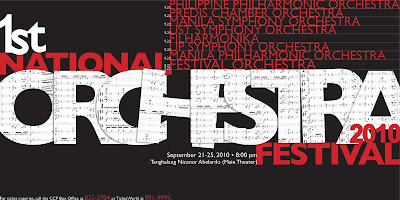 Want to win a pair of tickets to the 1st National Orchestra Festival Concerts happening at the Cultural Center of the Philippines (CCP) in Manila from September 21-25, 2010 at 8:00 pm? Vintersections.com is giving away 8 pairs of tickets to this big concert event. This event, tagged as “Magnitude 7 on the Orchestra Scale," will feature concerts by seven of the country’s finest orchestras namely: the FILharmoniKA, the Manila Symphony Orchestra, UP Orchestra, Angono Chamber Orchestra, the UST Symphony Orchestra, the PREDIS Chamber Orchestra and the Philippine Philharmonic Orchestra. a.) Blog about your reason/s why you should win the tickets to the orchestra music concert and why you like to watch it, who will you invite to and why (since each winner gets 2 tickets). Indicate also your preference of concert sked (either Set-A or Set-B ticket. Please see the ticket prices below). c.) Link your post also to this particular blog post (contest): http://www.vintersections.com/2010/09/win-pair-of-tickets-to-1st-national.html#more . So you shall have 2 links to use. - Link to your blog post so I could verify. - Write your complete name and the account username/s you will use to plug your blog post entry. - Your email address so I could send you the details in case you win. - Optional: Your mobile #. Easy, isn't it? But wait, there's more! 3. Entries will be reviewed by me and a friend. Entries will then be ranked. The best and creative answers win a pair of tickets to the orchestra concert. Incomplete entries will not be considered. 4. Entries will be accepted until September 19, 2010 (Sunday) at 12:00 midnight. 5. Winners will be announced through (a) this blog site/ blog post, (b) your blog post, (c) your email address. So please check your email on September 20, 2010 if you win. 6. When notified of your winning, please advise me through email which specific concert schedule you would prefer. All other details will be sent to your email. Depending on the number of participants to this contest, prized tickets can be added.